Nearby Kelowna offers every vacation retreat imaginable, all within a 7-hour drive from Calgary, 4-hour drive from Vancouver or 1-hour flight. 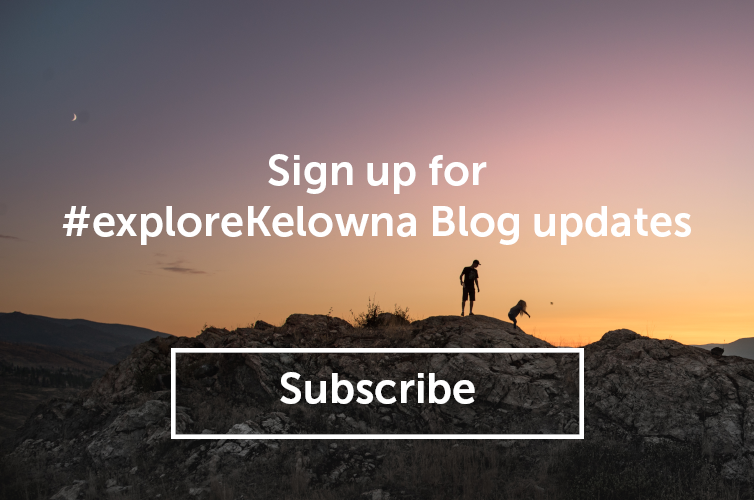 For eager urbanites and adventurers alike, the gem of the Okanagan has an abundance of activities and establishments that will have you energized by day and blissful by sunset. Fill your evenings with shopping and snacking along the main strip at Bernard Avenue, which is dotted with shops and restaurants and ends right at the beach! If you’re visiting in July and August, extend your walk a little longer and travel the downtown, lakefront boardwalk to Waterfront Park. 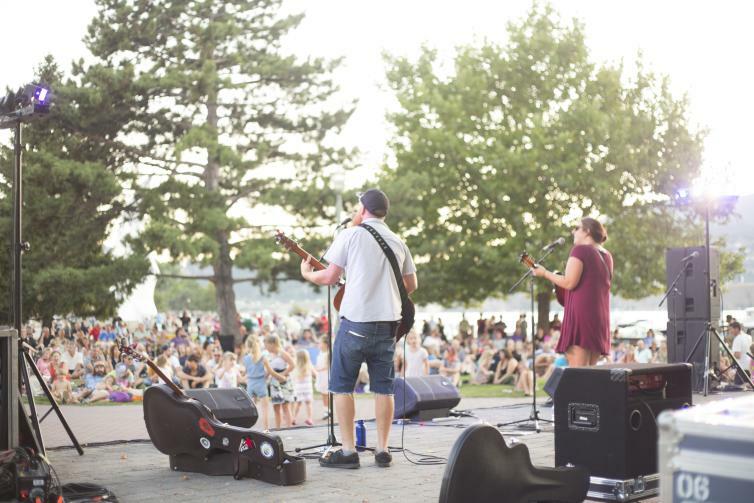 There you can enjoy Parks Alive!, a live music and concert series happening most nights of the week. When visiting any new city, you better spend time exploring the area around it. 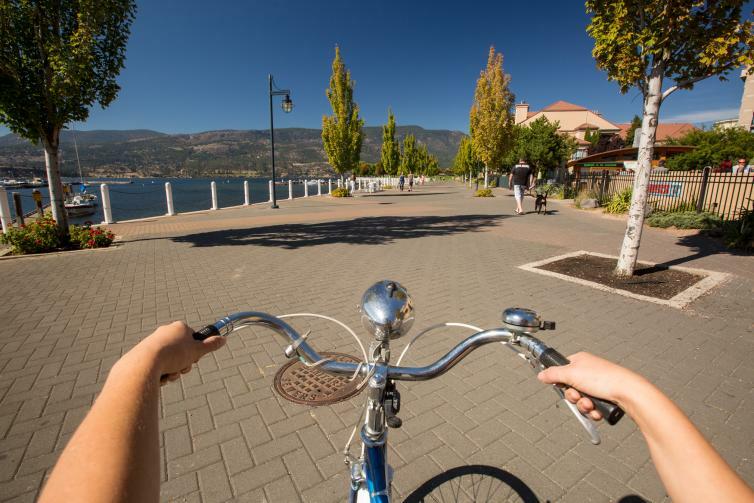 With Monashee Adventure Tours, you can rent bicycles and pedal the scenic route along local trails or explore Kelowna’s history and public art. If you’re looking to make a day of it, the wide variety of adventure activities will keep you busy. These include parasailing Okanagan Lake, bike rides through canyons and gliding through treetops by zipline. 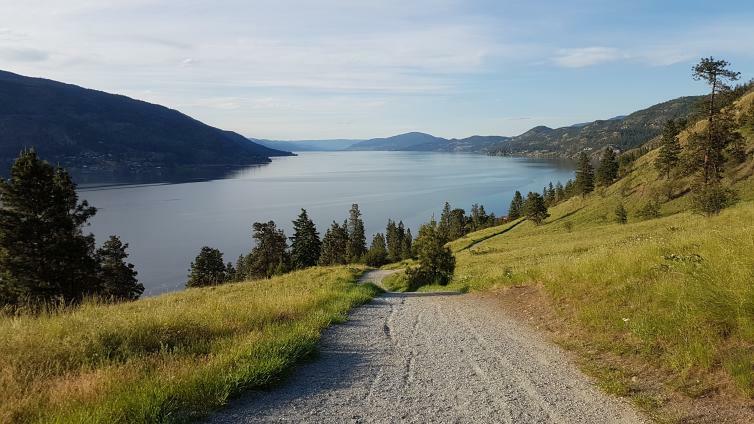 There are plenty of scenic hikes to choose from at Knox Mountain, which offers beautiful views of the countryside and lake from its many trails. We recommend checking out Paul’s Tomb, an easy hike accessible from the entrance on Ellis Street. The route offers access to a secluded swimming spot where you and the family can cool off surrounded by nothing but nature. Or, travel back in time to Myra Canyon, where you can hike or cycle through two tunnels and along 18 trestle bridges as you explore the scenic Kettle Valley Railway. 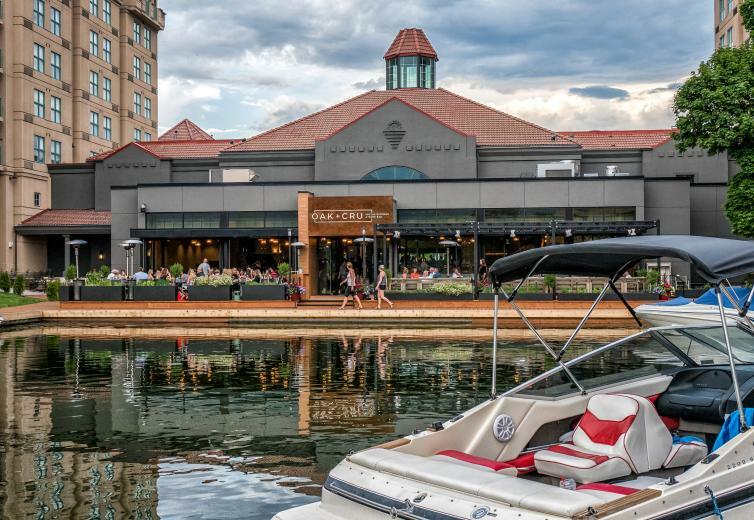 You don’t need to wander too far from the beach to enjoy Kelowna’s impressive dining options. Indulge at the Delta Hotels by Marriot Grand Okanagan Resort‘s new social kitchen and wine bar, OAK + CRU, which offers an extensive Okanagan wine list and stunning waterfront views. On warm days, we highly recommend visiting Smack DAB at Manteo Resort. The menu boasts “crazy good food” that will have you saying “hello” to your taste buds one at a time. 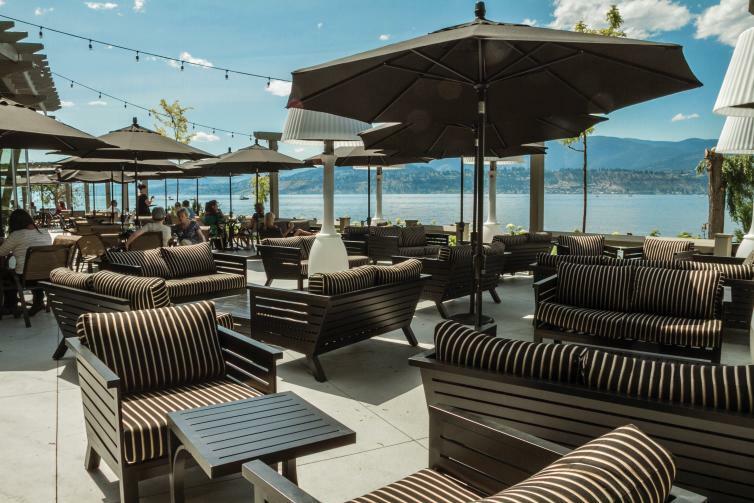 Equally important, it has one of Kelowna’s best and largest lakeside patios, with plush seating that will make you feel like a celebrity. Busy families looking for lots of activities should check in at the Casa Loma Lakeshore Resort. Rent one of the large, cozy condo units that offer access to the lake, an outdoor swimming pool, hot tubs and tennis courts. This spot is just five minutes from downtown, making it the perfect bridge between the city’s shops and restaurants and the area’s natural beauty. 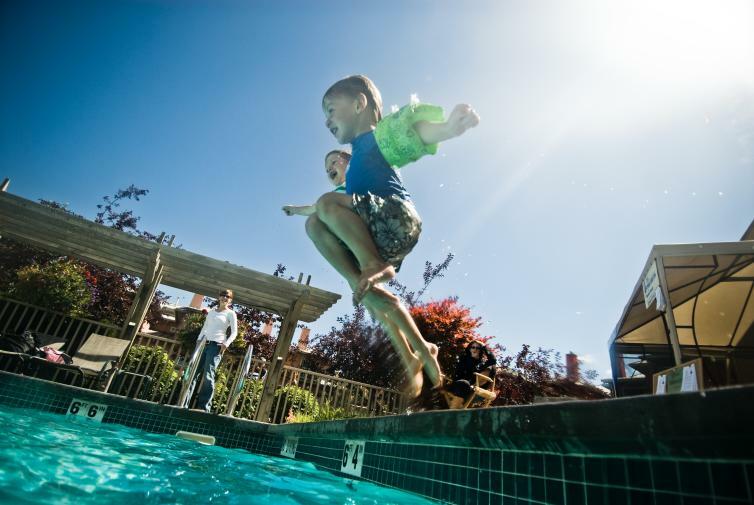 The Manteo Resort is equally perfect for active families, as it has an outdoor waterslide and kids’ spray park and offers water sports rentals. There’s also a nine-hole putting green and tennis courts, so mom and dad have a chance to improve their games while the kids play nearby. 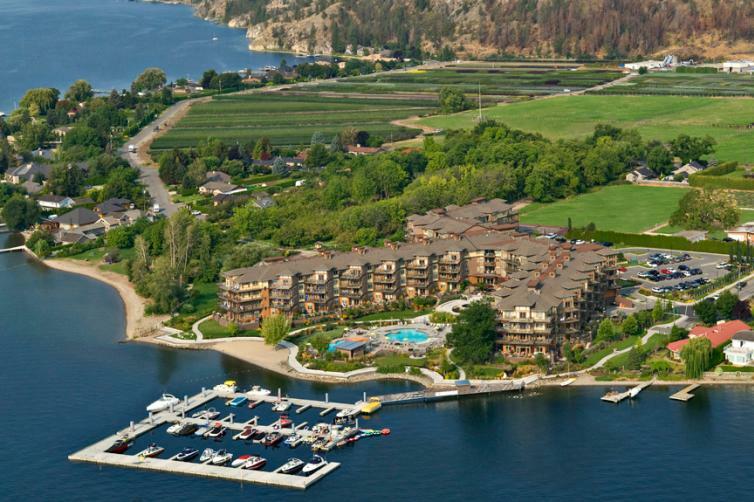 After a day of fun, everyone can gather at the waterfront restaurant and enjoy views of Okanagan Lake and the rolling vineyards. Does condominium-style living with immediate access to the beach, hot tubs and a large outdoor pool inspire you? 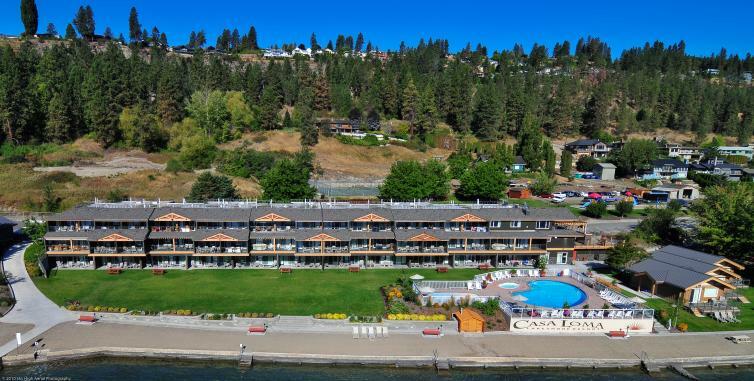 The Cove Lakeside Resort has you covered. There are even spa amenities to pamper you and fire pits to add a warm, rustic touch to your summer nights. What better way to cap off your trip to the Okanagan than with a night of stargazing and relaxing with the family?